I was having the time of my life.t 6 years old I was taught to swim by my older cousin. We would both climb over the wall of the local public pool to swim a few lengths after hours. It was those late nights in the pool that ignited a passion for the water that would grow more intense as I got older. 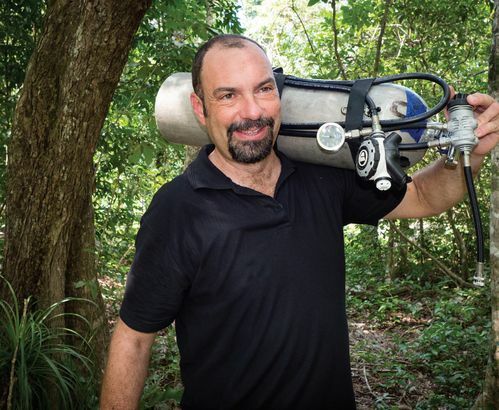 My roles in diving up to this point as the Technical Diving Director RAID Southern Africa and RAID International Tec Examiner have included just about everything one could do in this industry. My diving career started as a commercial diver in Cape Town and Namibia. It wasn’t long until I was snagged by the lure of being an instructor in the warm waters of the Indian Ocean, so, in December 1996, I became a PADI Instructor. Going from commercial to recreational was an easy transition, and I believe it was the commercial training I had, that made me very relaxed underwater in the recreational environment. Let me tell you, spending time on dive holidays in exotic locations was easier to handle than the harsh working environment of an underwater labourer. Apart from the odd job here and there, I never really worked again as a commercial diver. Unfortunately, in 1998, I had a major car accident and spent a long time in hospital recovering. I was told that my diving career was over and moved away from diving almost completely. Two years later, I was missing the ocean so much that it was all I could think about. I needed to be back underwater and it had to happen quickly. My doctors were sceptical but they gave me the go ahead and told me to take it easy. I couldn’t wait to get back onto my favourite “local” dive, Pinnacle. I missed the warm, blue ocean and I especially missed the Zambezis. I’ve done thousands of dives all around the world, but there is just nothing like Pinnacle on a good day. I will never forget one dive seeing a Tiger shark, Leopard shark, Zambezis, a wall of hammerheads, devil rays and a fleeting school of Sailfish. I was back in the industry full time, training one diver after the next. I was having the time of my life. I got involved with instructor training which I really enjoyed, but there was always something missing. Recreational diving was not challenging enough. I needed to do some commercial diving again, until someone suggested I give technical diving a go. In 2006 I started my technical diving journey. I was hooked and was diving deep or in caves almost every weekend. I wanted to learn as much as I could and did courses with various instructors through TDI and IANTD. I did training with Instructors locally, in the USA, UK and Egypt (Red Sea). Some of my favourite technical dives including the Oceanos wreck and the caves in Mexico and Florida. I gradually worked my way up the technical diving ladder, becoming a trimix instructor, cave instructor and rebreather instructor. Eventually, I become an SDI and TDI Instructor Trainer and Examiner. From 2010 I accepted the position of Regional Manager for SDI & TDI Southern Africa – a position I proudly held until I joined RAID in 2017. Today my role in the industry is almost entirely focused on training technical divers and instructors around the world, most recently contributing to the development of new training products for RAID International. Some of the courses I have written for RAID include the Liberty CCR, Liberty Siedmount CCR and Performance Diver. With a few more in the pipeline… I’m also proudly an ambassador for Otter Drysuits, Apeks and International Diving Systems.